U.S. Customs and Border Protection have ordered medical checks on every child in its custody, following the death of two Guatemalan children in recent weeks. On Christmas Eve, an 8-year-old Guatemalan boy named Felipe Gómez Alonzo died in New Mexico while in CBP custody. U.S. Customs and Border Protection have ordered medical checks on every child in its custody, following the death of two Guatemalan children in recent weeks. On Christmas Eve, an 8-year-old Guatemalan boy named Felipe Gómez Alonzo died in New Mexico while in CBP custody. This follows the death of a 7-year-old indigenous Guatemalan girl, Jakelin Caal Maquín, who died on December 8—also in New Mexico—two days after she and her father presented themselves at the border in a bid for asylum. 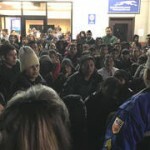 Meanwhile, authorities in El Paso, Texas, scrambled over the Christmas holiday to assist hundreds of migrant asylum seekers who were dropped off suddenly by ICE officials outside a Greyhound bus terminal without any plan to house them. Dylan Corbett is interviewed, who is the executive director of Hope Border Institute, an El Paso-based charity that assists migrants.